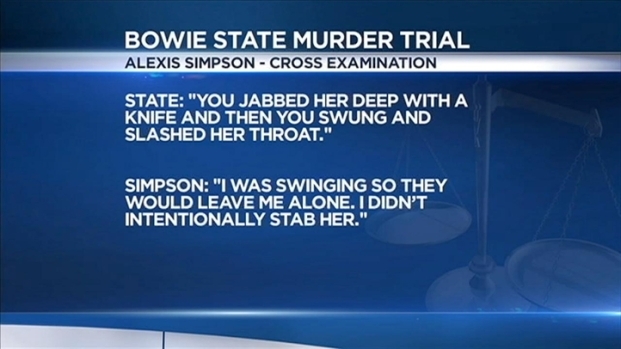 A jury found former Bowie State student Alexis Simpson not guilty on all seven counts in the fatal stabbing of her roommate Dominique Frazier in September 2011. The jury got the case Thursday afternoon and had a verdict in about three hours. Simpson left the court house in Prince George's County without speaking to the media, but her attorney spoke on her behalf. "This is a self-defense case," said defense attorney Christopher Griffiths. "Alexis, in my mind, there is no question, acted in self defense. We are very gratified by the verdict." Prosecutor Tara Jackson said the jury did its job. "We did the very best we knew how to do -- we presented the evidence as it was, and the jury gave us their verdict." Simpson, 20, took the stand in her own defense Thursday morning. On Sept. 15, students were preparing for a homecoming comedy show when Simpson and Frazier got into an altercation over loud music playing from the victim’s iPod. It would be the last in a series of disagreements the two had had that semester. Alexis Simpson took the stand in her murder trial Thursday, and said she didn't intentionally kill her roommate, Dominique Frazier. Prince George's County Bureau Chief Tracee Wilkins reports. Other witnesses testified that Simpson was the one to throw the first punch. After that initial fight, Simpson went to her room looking for her inhaler, she said. Her attorney asked: "Did you take anything else out of your room?" 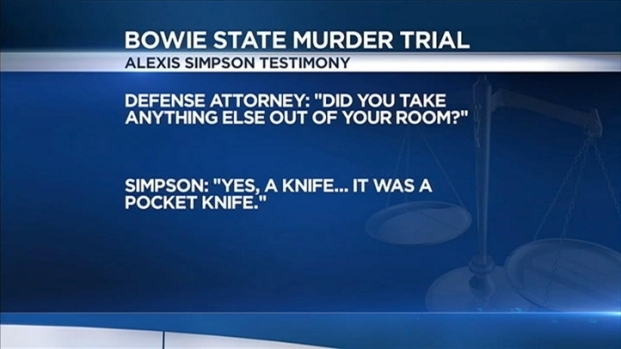 Alexis Simpson testified Thursday that she didn't intentionally kill her former Bowie State roommate Dominique Frazier. News4's Tracee Wilkins describes how Simpson handled questions from prosecutors when she was on the stand. Simpson replied: "Yes, a knife ... It was a pocket knife." Simpson described the moments leading up to the actual stabbing. During cross examination Wednesday -- Day 2 of Simpson’s trial -- the state’s first witness, Frazier’s friend Kiaira Johnson, described what she saw when the stabbing happened. Simpson and Frazier stopped getting along soon after the beginning of the school year. In opening statements Tuesday, the attorney for the defense said Simpson told dorm management, “They are threatening me, and I’m afraid they are going to jump me … I just want to change rooms.” That request was denied.